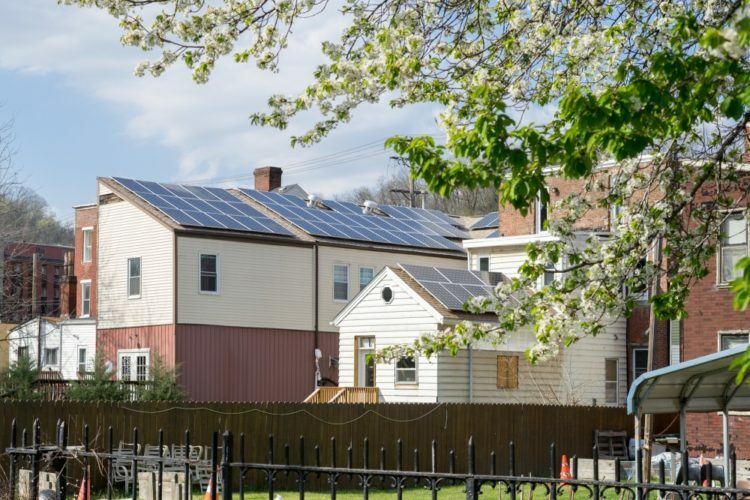 New solar installations, a completed riverfront park, student-led art installations and a community-spanning environmental justice policy are just some of the projects to be funded by a $2.3 million grant from the Henry L. Hillman Foundation for the Triboro Ecodistrict of Millvale, Etna and Sharpsburg. The project, in the works since late 2016, is a project of New Sun Rising, Etna Economic Development Corporation, and the Sharpsburg Neighborhood Organization, with support from sustainable architecture and consulting firm evolveEA. Brittany Reno, executive director of the Sharpsburg Neighborhood Organization, says that it was during those early discussions that all three boroughs recognized that they were facing many of the same issues surrounding equity, sustainability, and the environment. The funding is split about equally between the three boroughs. Work kicks off this summer with new solar installations at New Sun Rising’s Millvale Moose headquarters, the Garden of Etna, and, pending board approval, the Sharpsburg Community Library. It will include co-working space, green tech programming, a few affordable housing units and possibly even a retail incubation program. Solar panels on the Millvale library. Brian Conway photo. Funding will support free community wi-fi and air quality monitoring in Sharpsburg, provided by Meta Mesh Wireless Communities and DECO Resources, with additional funding coming from Dancing Gnome Craft Brewery and Ketchup City Creative. In Etna, funding will be used to complete construction on the long-anticipated Etna Riverfront Park and complete the Etna portion of the Three Rivers Heritage Trail for eventual connection with the city of Pittsburgh and north to Aspinwall and beyond. Additional grant funding will go toward equitable housing repairs, public art projects, student internships in the solar energy field, and micro-funding for other resident-led projects. That grassroots effort, which first began in 2011, serves as the model for community engagement throughout the Triboro Ecodistrict: Etna hosted an inaugural Ecodistrict meeting in March. Sharpsburg began their community vision plan in conjunction with evolveEA some 18 months ago. “The Triboro EcoDistrict represents a new dream where resident leaders expand the sense of what is possible and work together to create a more inclusive, resilient and brighter today and tomorrow,” wrote New Sun Rising’s EcoDistrict Coordinator, Brian Wolovich. Local residents and others interested in learning more about the Triboro Ecodistrict can attend an education session Tuesday, June 5th, 6 to 8:30 pm, at Fugh Hall in Etna, or the Eco Blast kickoff pool party June 23, 5 to 9 pm, at the Etna Pool. The post Triboro Ecodistrict of Millvale, Etna and Sharpsburg receive over $2 million for green infrastructure, art & education appeared first on NEXTpittsburgh.